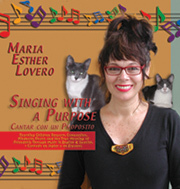 Maria sings with purpose..... her new CD educates and guides children to develop empathy and respect for oneself and others, including animals and the environment. A portion of the proceeds go to help children victims of abuse, to help abused and neglected animals and to education, to raise awareness about these disturbing matters. Singing, Live Music, Games, Instruments and Lots of FUN!!! Call 954-929-4531 or EMAIL for more information.